The children, staff and governors of Stanford-in-the-Vale would like to welcome you and your family to our school. 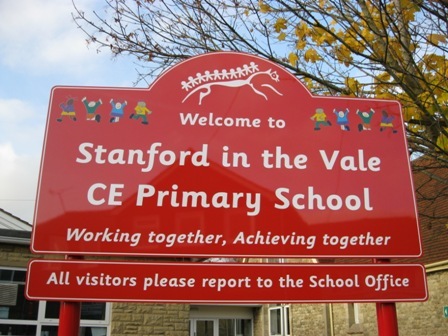 Stanford in the Vale School is a Church of England Voluntary Controlled Primary School. The school was established in the early 1870s and continues to be part of the local Church community. The school serves the villages of Stanford, Goosey, Hatford and Challow Station. We currently have 197 children taught in seven classes from Foundation through to Year 6, all children in each class are in the same age group. We build on the early learning experiences which children have had at home, Pre-school and in Nursery settings. Our local secondary schools are Faringdon Community College and King Alfred’s Academy, where we aim for our pupils to arrive well- prepared to continue their education. We place a strong emphasis on the creative curriculum and look to develop enquiring minds that enjoy learning and enable achievement. We want children to become independent learners who take ownership of their learning and develop a thirst for life long knowledge. Academic standards continue to be good and we continue to work hard to maximise the exciting potential we have within the school. There is an extremely talented and dedicated group of staff and governors who work hard to ensure the opportunities we provide are varied and allow opportunity for all. The school receives a great deal of support from parents and the community, with fund raising and help in school. We are very aware of our role within the village and try to give the children an appreciation of their privileges and responsibilities as part of this community.